KidsTown's brand new cafe is open for business - Aquamoves – Indoor and outdoor pools, fitness facilities and programs in Shepparton, Victoria. 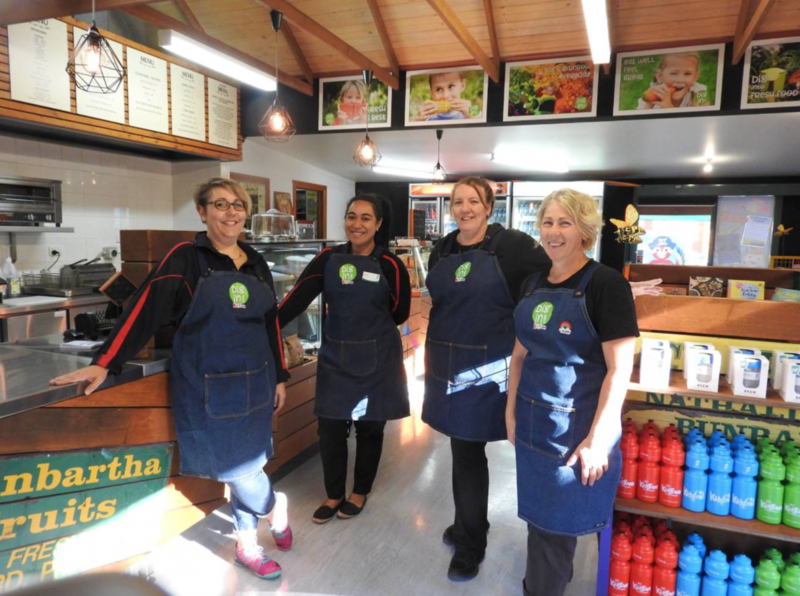 A fresh and healthy new café has opened at KidsTown these school holidays. The Dig In Café features an all new menu focusing on healthy eating and encouraging children, parents or their carers to eat a rainbow every day. Designed with the help of local nutritionist and mum, Mel Hall, the Dig In menu has been designed to make healthy eating fun. Not only celebrating all the fabulous fresh produce available to us here in the Goulburn Valley, the café fit out also draws its inspiration from the many families, businesses and volunteers that have been involved in the creation and on-going operation of KidsTown since its inception back in 1995. The Dig In Café is open every day during the school holidays from 9.30am until 4pm and offers a range of healthy and fun hot and cold food, coffee, drinks and snacks. The Café also features an all new range of kids merchandise and gifts including train hats and whistles, kitchen gardening packs, kid friendly recipe books and cooking equipment and wooden toys. KidsTown is open from dawn to dusk every day of the year and entry is by gold coin. KidsTown will be hosting its annual ‘Easter Eggstravaganza’ on Tuesday, April 11, Wednesday, April 12 and Thursday, April 13 with Easter egg hunts for both younger and older children. For full details visit the KidsTown Facebook page. For party bookings or catering packages please contact the KidsTown Dig In Café team on 5831 4213. KidsTown and the Dig In Café are proudly provided by the Greater Shepparton City Council and can be found at 7287 Midland Highway, Mooroopna. Article curtesy of The Shepparton Adviser from 5 April 2017. Celebrating Fresh Food: From left, KidsTown Dig In Café and events attendants, Natasha Pearson, Selina Sauiluna and Pauline Marslen-Neil and KidsTown programs and café duty supervisor, Leanne Houkes-Wilson.